Thanks to some 21st century technology and lots of hard work, the Jesse James Building which houses the Inn’s suites was rebuilt and opened in 2005. The building, named after the infamous nephew of one of the previous owners who spent some time in Paso after being shot during a failed bank robbery, featured suites dedicated to the some of the more famous characters who had a role in the history of the Inn. The suites feature oversized bedrooms with a separate sitting area, large bathrooms, and an outdoor private spa tub located on a garden patio. When you stay in our Jesse James two-room suites, you’ll enjoy spacious accommodations that feature a bedroom with a comfortable king or two queen beds, plush pull-out sofa, a double vanity bathroom and an outdoor private spa tub located on your patio so you can soak your worries away. An ultimate destination for relaxation and adventure, Paso Robles Inn is proud to welcome you to our Jesse James suites so you can discover the finer side of Central California. Each suite comes with a story based on a historical event – from the Pittsburg Pirates to Ignance Paderweski to our very own Founder. 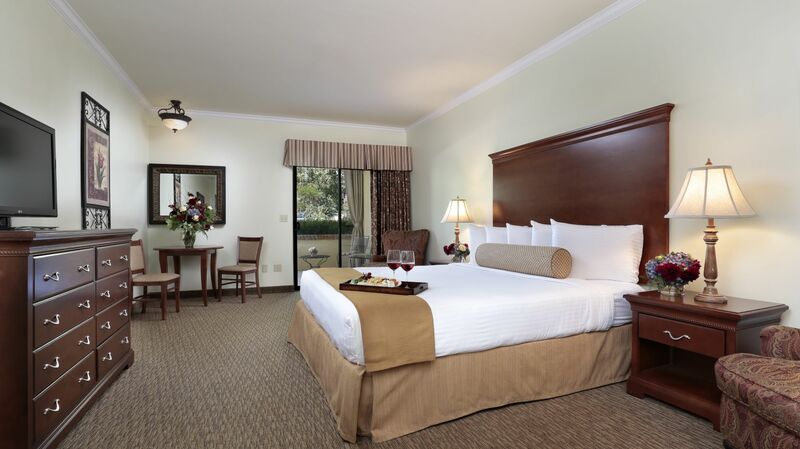 Immerse yourself in Paso Robles history when you stay in a luxurious suite at the Paso Robles Inn. 1857 - Daniel and James Blackburn came from West Virginia to California to strike it rich in the gold fields. That success, along with a profitable lumber business, provided them with the money to purchase Rancho El Paso de Robles which consisted of 25,993 acres of land, the naturally flowing hot springs, and the well-established stagecoach stop. When Daniel moved to the rancho, gangs of lawless men were roaming the countryside robbing stages and wagons. Soon Daniel got involved with the “Vigilance Committee” whose goal it was to stop the lawlessness – and not long after the group made him sheriff. Now that stagecoaches could travel through the area, the regularly scheduled stage stopped in Paso Robles, bringing with it visitors to the area. For the next two decades, the Blackburns made improvements to the “resort” including building a bathhouse and hotel, and the fame started to grow. For more information turn to page 11 of “The History of Paso Robles Inn” by Ann Martin Bowler. 1868 – Two infamous outlaws, Frank and Jesse James, were busy robbing trains and getting themselves on the “Most Wanted” list. Then Jesse got shot and his lung wasn’t healing properly. In the spring of 1868, the duo headed to California to “cool off” and give Jesse a chance to heal. Frank made the overland journey by train and stage. Jesse, too weak for the overland journey, took a steam around the horn to San Francisco, and then traveled by stage to San Luis Obispo County where they sought refuge with their uncle. The hot springs in Paso Robles helped Jesse heal from his gunshot wounds and he and his brother were soon restless. The very next summer, their uncle bought them steamship tickets back to New York. For more information turn to page 26 of “The History of Paso Robles Inn” by Ann Martin Bowler. 1913 - Famous pianist Ignace Paderewski nearly had to end his career when his hands could no longer play. In an effort to save his career, Paderewski ventured to Paso Robles where he spent three weeks bathing in the mineral waters until his hands were restored. Now a firm believer in the baths’ health-giving properties, he and his Baroness wife, Helen, returned to the hot springs many times over the next 30 years. Today, the Paso Robles Inn is the proud owner of one of his pianos which sits in the entry to the ballroom. Guests can also dine in the private Paderewski Room located adjacent to the Steakhouse. For more information turn to page 59 of “The History of Paso Robles Inn” by Ann Martin Bowler. 1924 - The famed Pirates made Paso Robles and the hotel their designated spring training location from 1924 to 1934. Each year, the players were warmly welcomed into town. When the Pirate’s hosted a game, many businesses closed their doors so that everyone could watch. It was said that the hotel’s hot sulfur baths were the main reason for choosing Paso Robles as a training site – and greatly appreciated by the players to soothe stiff elbows and other aches and pains. During this era, Paso Robles developed one of the finest baseball diamonds in the nation. While other towns tried to lure big league teams with large sums of money, Pittsburgh actually paid Paso Robles $150 to use the local field. For more information turn to page 63 of “The History of Paso Robles Inn” by Ann Martin Bowler. 1940 - Paso Robles Hot Springs Hotel’s golden era ended abruptly due to a massive fire on a cold December night in 1940. Despite arriving on the scene within minutes of the alarm, firefighters were quickly driven out of the hotel’s central hallways by scorching flames. Realizing that the central part of the hotel was doomed, firefighters concentrated their efforts on saving the gracious dining room wing of the hotel – now what we call the ballroom – and the only part of the hotel that survived the fire. This suite is named after J.H. Emsley, a brave night clerk who discovered the fire on the third floor. He hurried down the stairs and sounded the alarm, then ran from room to room to alert the guests. While 200 guests were escaping the fire, he suffered a heart attack and died. He was the only fatality caused by the tragic fire. For more information turn to page 76 of “The History of Paso Robles Inn” by Ann Martin Bowler. 1999 - Tom Martin and family purchased the Paso Robles Inn and immediately began a major renovation to bring the Inn back to its former glory. The first project was the coffee shop. Its 50-foot, circular counter was rebuilt and its original chrome bar stools reinstalled. A 172-square –foot mural depicting a South American cattle roundup was restored. Then onto the gardens… after replacing a dated pool and removing an asphalt driveway that cut through the gardens, bridges and walkways were created. Next, the dining room was updated, the rooms remodeled, and a major floor to ceiling restoration of the then boarded-up ballroom completed. Since then, there have been ongoing renovations at the Inn as the Martin Family continues to serve as stewards of the historic hotel. For more information turn to page 90 of “The History of Paso Robles Inn” by Ann Martin Bowler. 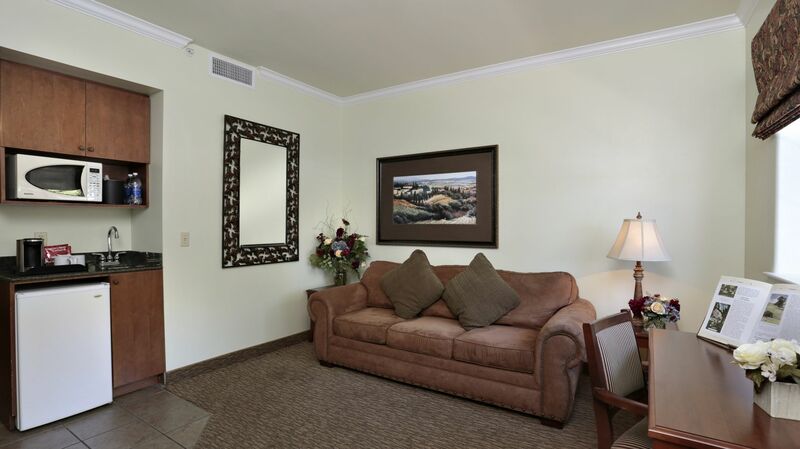 *Suites are subject to availability and are available by calling the hotel at 805-238-2660.